Recently I was at the Friday Street car boot sale in Suffolk. It is one of my pleasures in life, I love being in Suffolk, I love being able to mooch and explore around the car boot in fresh air (as much as I love London - car boots here come with a tad more pollution). On my last visit I came across a bundle of embroideries. 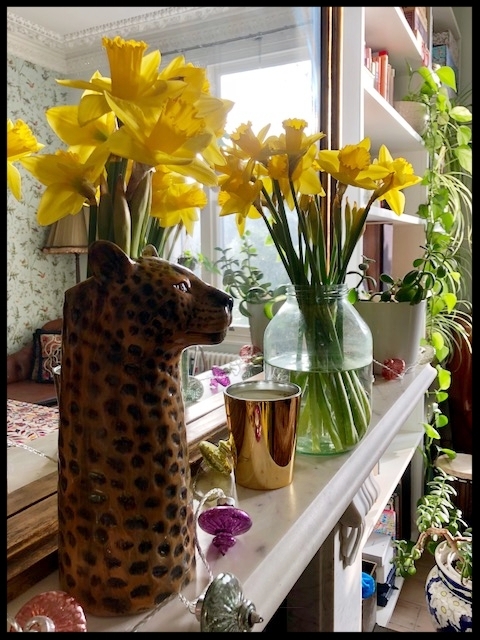 Our home is full of interesting and amazing objects and images that love and truth be known there isn't that much space for adding to it - sometimes I change a few things around or swap them. So, I needed some ideas on how to use the embroideries outside of just having them on the wall - and I did come up with some ideas - this one being the most simple and straight forward to do. This gillet or jacket project can be sewn by sewing machine (your own or take to a dry cleaner / tailor) or with a little bit more effort sewn by hand. I simply took a denim jacket. The one I decided to use had no sleeves and is perfect for the coming Spring weather. 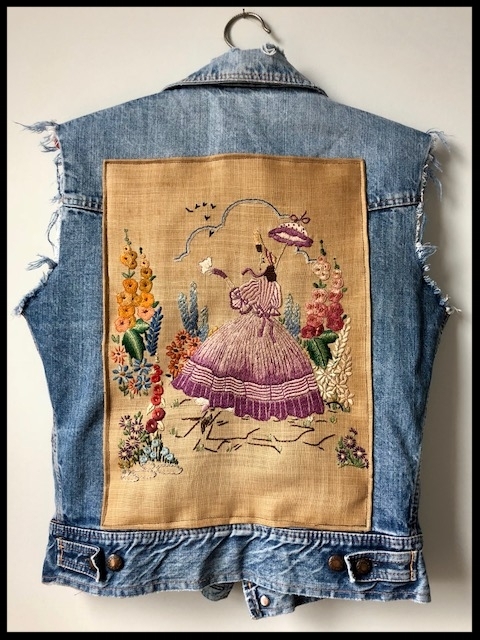 I took the embroidery from its frame (frame to be up-cycled in a later project) and simply placed it on the back of the jacket (the edges of the fabric having already been folded under). I then pinned it in to place and with my sewing machine sewed around the embroidery close to the edge. I chose a blue thread as I wanted the thread to be seen and echo the colour of the denim jacket. And that apart from removing pins - is it! I only just came across this photograph reference ctreasury from Instagram. I believe it is photograph taken from New York fashion week 2018. What I do know is that it is genius. I love it! I'm not advocating you chop up all your widely expansive handbags but what about the ones we see in charity shops thats are fake? Or what about a scarf that you no longer wish to use? 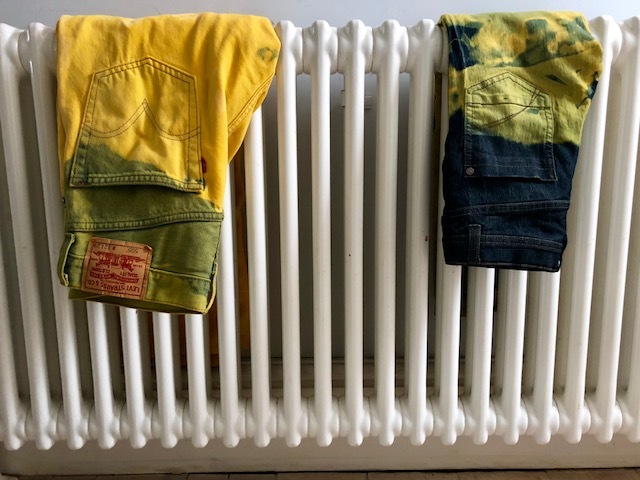 I know next on my 'sewing list' is making a pair of these jeans - I just need to find 'the thing' that needs re-purposing and its a job done! March 09, 2018 in Dye Project. Evidently denim jackets are set to be big - in style, shape and fashion this coming spring. I have already been working on a few ideas over the last few months, mainly involving sewing and reworking old denim jackets that people have discarded for various reasons - holes, missing buttons, rips. 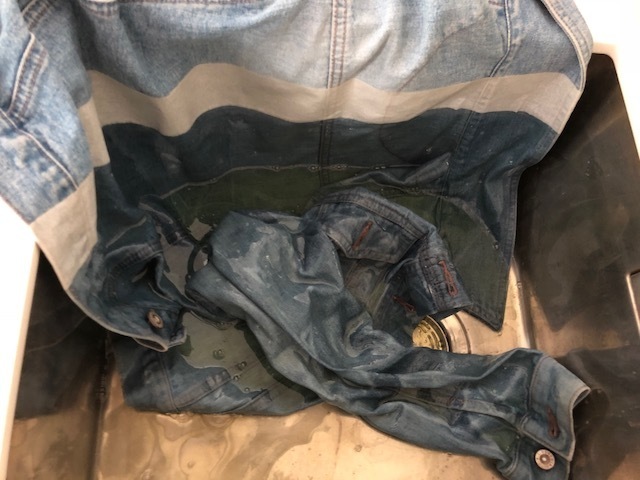 But I had a quick idea last week with involves no sewing and is a quick and easy way to get the current trend of re-working denim - simply fake it - with bleach. Simply place the masking tape down the back of the jacket so that the edge of the tape is the in the centre. Place over a sink as below and add bleach. Leave for up to an hour. Take the tape off and then put into the washing machine with detergent on a 40 degree wash.